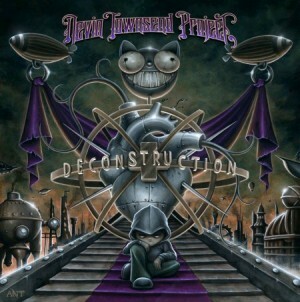 I’m listening to an album called “Deconstruction” by the Devin Townsend Project. It’s brilliant. Love it. Most people will not like it. Some will totally hate it. But, I love it. It’s a 70 minute journey of a man examining his place in the universe and finding that he was seriously self-indulgent and self-important. It’s serious, but at the same time, it’s funny because the guy comes to see that he’s about as significant as a cheeseburger in the grand scheme of things. I think. Or maybe it’s that he realizes that life can be boiled down and reduced to eat, love, poop. And, cheeseburgers take part in at least two of those.